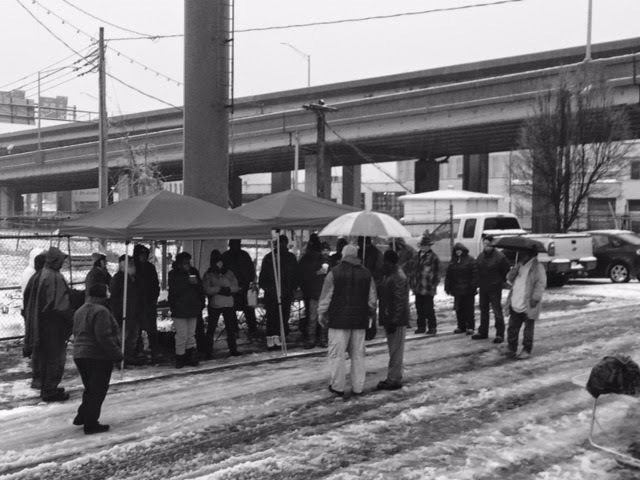 Every Sunday since October of 2013 a dedicated group of caring folks have gathered between the bridges in Springfield MA at 7:30 AM. Through the New England snow, rain, cold, summer humidity they come out to feed, cloth and minister to a collected group of Homeless souls. The photo here was taken yesterday on a cold, wet, rainy January day. I have seen as many as 50 homeless folks gather to hear the Word of God. On this day about 25 brave souls met us for hot coffee and a powerful Word preached by minister Larry. They gathered under some tents while a homeless man held an umbrella over Larry's head. He preached of a new song promised to each of us that know Jesus Christ as our Savior. We sang and fellowshipped for about 90 minutes. It was an incredible way to start the day and the new year. Following this service my wife and I attended a small church with a powerful preacher for an 11:00 service. I was taken by the fact that less people showed up on this snowy, cold, rainy day to hear the Word of God in a heated, covered indoor church long after the rain stopped. Jesus said "I am the bread of life, those who come to me will never hunger". I wonder if Jesus will be giving rain checks.